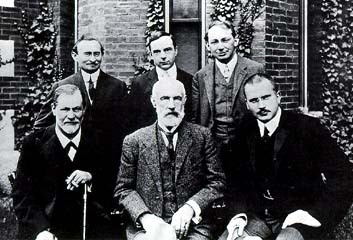 In the early fall of 1909, Sigmund Freud and Carl Jung were invited to speak at a conference in the United States at Clark University in Worcester, Massachusetts, which was then celebrating its twentieth anniversary. The unspoken hope was that maybe these two fathers of psychoanalysis could address issues of anxiety and delirium which left many in the medical profession baffled and helpless. Many fascinating guests were in attendance for the talks. Besides philosopher and psychologist William James and America's prominent psychiatrist Adolf Meyer, activist and anarchist Emma Goldman, who three years earlier began speaking out for women's rights and birth control, turned up with an entourage to disrupt the proceedings. In the five lectures that Freud would deliver during his stay, he would discuss 'the talking cure' and his work with Anna O. who suffered from a diagnosed hysteria those doctors in Vienna couldn't identify. But if the gathered throng had hoped for a simple solution to the emotional problems erupting in the modern age, Freud served to disappoint and anger the captive audience. Besides introducing them to his concept of infantile sexuality, where he suggested that traumatic memories stem from "the enduring, repressed wishes of childhood" which are "almost invariably of a sexual nature," he went on to claim that there was no cure from "the original animality of our natures." Author Gary Greenberg (Manufacturing Depression), who recounted this famous event in a fascinating and perceptive article ("The War on Unhappiness") for Harpers magazine in 2010, aptly described how the tumult created by these lectures would effect American psychiatry in the years to come. "Freud had come to the land of unbridled optimism to inform its inhabitants that a fragile equipoise between repression and abandon was the best they could hope for, and perpetual uncertainty their lot," Greenberg wrote. "The dourness of this message is probably what he had in mind when, as his ship pulled into New York Harbor, he turned to Jung and said, 'Don't they know we are bringing them the plague?'" The reaction to this plague would manifest itself in the psychiatric world for many years as a perpetual pendulum swing between the use of electric shock and lobotomy to pharmaceutics as a means to make people feel happy rather than anxious, cured rather than disturbed, adjusted rather than contrary. In other words, to paraphrase Greenberg, the psychiatric profession ignored Freud's basic message that psychoanalysis isn't about sweeping the dust from our chimneys, but instead about seeing what is hidden in the soot. Movies (Shine, A Beautiful Mind) and television (The Sopranos, In Treatment) have seldom dealt directly with examining the soot choosing instead the road to redemption through chimney sweeping. Psychoanalysts are usually no more than benign guidance counselors who lead people in finding their personal salvation rather than examining the deeper unconscious roots of their misery. In the new HBO series Enlightened, however, the very subject of salvation becomes the whole issue. Amy Jellicoe (Laura Dern) is a self-destructive 40-year old corporate sales executive who has just returned to her home in California after a stay in a holistic treatment center, as a result of having a meltdown at work that was triggered by a number of self-destructive habits (including sleeping with her married boss). After her transformative experience, she feels that she is now an agent of change who, through meditation and inner healing, has come back to work with the zeal of a prophet. She feels her company can now change the world. Of course, what Amy can't immediately see is that, despite her 'enlightened' state, people don't share her enthusiasm for pop spiritualism. This includes her mother (played with a sly subtlety by real-life actress mom Diane Ladd) who, when Amy tries to start 'meaningful dialogue' with her, looks puzzled and asks her why; her former boss who recoils in terror at Amy's attempts to 'find closure'; her former assistant Krista (Sarah Burns) who has inherited her former boss' job in her absence (she also talks friendship but acts contrary); and her former husband Levi (Luke Wilson) who might snort cocaine and eat junk food, but has an easy non-judgmental manner that perceives a potential zealot in his midst. Created by Mike White (Chuck and Buck, the 2004 TV show Cracking Up) and Dern, Enlightened takes on New Age philosophies without (so far) taking comic short-cuts in satirizing their banalities. A large part of that might well be due to having Laura Dern in the lead role. Dern is a genius at unleashing a sunny warmth in her tall frame, a brightness that can light a room, but she can also turn herself into the kind of brassy broad that allows her to stridently command the room (as her mother once did in roles like her diner waitress in Alice Doesn't Live Here Anymore). Playing Katherine Harris, the Florida Secretary of State, in Recount (2008), a film about the battle for Florida in the 2000 Presidential election, Laura Dern turned Harris' obliviousness into a tour de force performance of comic derangement, a delicately lethal dose that she also brings to Enlightened. When Levi suggests to Amy that she isn't saved, but instead is hanging on by a slender thread, we can clearly see that Dern perches Amy's new found optimism over a desperate abyss. (When Amy returns to work, she gets demoted to data processing in the basement with 'circus freaks' that she hopes to convert to her holistic mission. Mike White plays one of her flaky co-workers.) After two episodes, it may be too early to tell if the series will turn as dim and curdled as White's Chuck and Buck; but for now, Enlightened unravels the quiet desperation that lurks beneath the sunny optimism of New Age hope, a hope that chooses to close the door on the threatening darkness of Freud's idea of the plague. If Amy sees the possibility of her new found faith lighting and saving the world from its animal nature, Michael Shannon's Curtis, a rural Ohio family man, is having apocalyptic visions and dark frightening dreams that he interprets as a secular rapture in Jeff Nichols' Take Shelter. Initially a happily married construction worker who is envied by his friends and co-workers, Curtis' life quickly turns into something less than appealing. After first seeing rippling storm clouds bearing yellow rain, and birds that arrange themselves in odd formations, Curtis can't tell whether these strange manifestations are part of an inherited paranoid schizophrenia from his institutionalized mother (Kathy Baker), or if he's having prophetic visions that he has to warn the world about. Take Shelter has an appetizing dramatic premise about how one man can't tell whether the storms he experiences are his own internal neurosis, or a manifestation of nature's own version of violent cruelty. But Take Shelter promises more than it ultimately delivers. 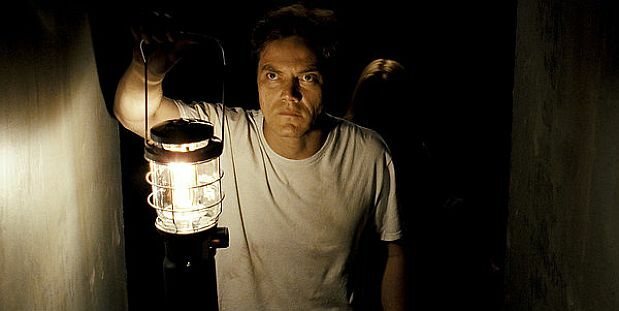 The first problem with Take Shelter is the casting of Michael Shannon in the lead role. It's pretty clear why Nichols (who worked with Shannon in his 2007 film Shotgun Stories) cast him in the part; Shannon's specialty is in playing tightly wound and emotionally armored characters who become completely unstitched. But as Shannon showed portraying the soldier with the fifty-mile stare in World Trade Center, the Holy Fool of Revolutionary Road, the mad Svengeli figure of Kim Fowley in The Runaways, or as the morally obsessed G-man of Boardwalk Empire, he has no mid-range as an actor. His emotional armor doesn't hide a character, it is his character. We never see what that solid granite face and those spooked eyes are hiding – except for a pending rage which usually comes to a full boil. (For those who long for one of Shannon's mother-of-all-meltdowns, he provides a beauty late in the picture.) Resembling Jack Nicholson in The Shining, but without the cartoon nuances, Michael Shannon looks disturbed and deranged before he even begins to fall apart. 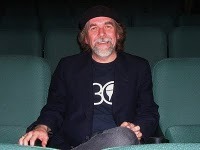 Instead of having us fear for a man who is losing his sense of reality, madness ends up inadvertently fulfilling him – as it did for Nicholson in Kubrick's folly. Jessica Chastain in Take Shelter. Even if an actor with better range had played the role, I'm still not sure if the movie would work. Despite Nichols gift for creating a visually compelling roiling canvas of apocalyptic imagery, there's a redundancy in the storytelling that becomes painfully repetitious. While we are constantly reminded of the schizophrenia in Curtis' family, it never really comes to anything dramatically perceptive (even though Kathy Baker provides a quietly spooked cameo). We watch Curtis exiling his dog to the backyard because it attacked him in a dream, or using up his family's funds to extend their storm shelter (even though his wife – played with some gravity by Jessica Chastain – and their deaf daughter need the money for their girl's new hearing implants). People generally stand around and watch him crack up while remaining impassive. The daughter never even recoils from her father's odd behaviour. Curtis later gives their dog to his brother without his wife and daughter – who claim to love the dog – even bothering to notice. Take Shelter quickly gives you the feeling of not really getting anywhere. Because the film merely catalogs – with some monotony – Curtis' mounting psychosis, you really don't get to examine what's hidden in the Freudian soot of Curtis' chimney. Instead we get an unsatisfying modernist version of an O. Henry ending that worked with more suspenseful intrigue years earlier on a half-hour The Twilight Zone. (In fact, HBO's Six Feet Under did this same material with a deeper sense of urgency and power in the episode "Bomb Shelter" from Season Five. James Cromwell, with calm, yet painful despair, plays a man who becomes obsessed with Armageddon and retires into the family bomb shelter.) Take Shelter could perhaps be perceived as some metaphor for post 9/11 America where people can't discern real fear from paranoia, but it would be a stretch to read that much into it. Besides, with Michael Shannon in the lead role, how would you even know the difference between true portent from imagined terror?